Inspired and led by the Honorable Minister Louis Farrakhan, more than two-million Black men gathered in Washington, D.C. to declare their right to justice to atone for their failure as men and to accept responsibility as the family head. 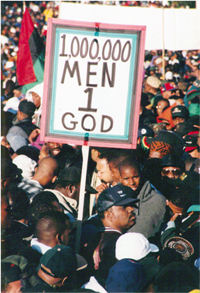 On that day, Monday, October 16, 1995 there was a sea of Black men, many who stood for 10 hours or more sharing, learning, listening, fasting, hugging, crying, laughing, and praying. The day produced a spirit of brotherhood, love, and unity like never before experienced among Black men in America. All creeds and classes were present: Christians, Muslims, Hebrews, Agnostics, nationalists, pan-Africanists, civil rights organizations, fraternal organizations, rich, poor, celebrities and people from nearly every organization, profession and walk of life were present. It was a day of atonement, reconciliation and responsibility. “The Million Man March was one of the most historic organizing and mobilizing events in the history of Black people in the United States,” said Chicago-based Dr. Conrad Worrill, who was a main organizer of the March and the current president emeritus of the National United Black Front. Along with those who attended, many men, women and children spent the day at home watching the event on television and participating in the day of fasting and absence. Workers did not go to work that day, children did not go to school that day and no one engaged in sport or play. During Min. Farrakhan's message to the millions gathered in the mall and those watching on television around the world that day, he explained to the world the need for atonement and he laid out the eight steps of atonement. Thus, for the past 15 years, people gather, reflect and observe the Holy Day of Atonement. 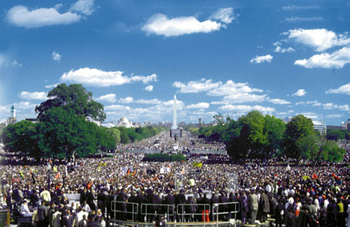 So many marches and campaigns were sparked by the Million Man March. In 1997 there was the Million Woman March, launched and organized in Philadelphia by Phile Chionesu, a grassroots activist and human rights advocate, also known as Empress Chi. “The Million Woman March came as a result of the Million Man March. I had not seen our community buzz like that in years. The life of the community was gone, but in 1995, because of the Million Man March, the streets starting buzzing again with life. My sons were going and so was I. The energy going down to the March and being there was just…I cannot describe it. This is the feeling that drew me to The Movement. There was a feeling there that had been missing for so long,” said Empress Chi. Still looking forward 15 years later, Empress Chi plans to launch, this month, the One in a Million Campaign. Her goal is to raise a million dollars. The money and resources will launch an independent school, establish a sanctuary house for women and children, establish Wholistic health centers, and create a line of hair care products. Accompanying the Man and Woman marches, there have been the Youth, Family, Millions More, and Million Reparations marches. In addition, there were several offshoots tapping into the theme popularized by Min. Farrakhan such as the Million Mom March (gun control), the Million Worker March (labor), and Million Father March (education). At the conclusion of the March, the millions of men repeated a pledge given by Minister Farrakhan that focused on a personal commitment to be responsible and active in improving the Black community. The purpose was for Black men to take responsibility for their own actions and to help develop their own communities, and to atone for their lack of responsibility. Many of the men assembled took the pledge given that day seriously and have been actively involved in making their word bond ever since. “The March changed my life and my perspective of life in so many ways. I (gained) a tremendous commitment to the betterment of my culture, and a heightened capacity to care and to love. I am now trying to live by the code of honor and the right conditions set forth in the pledge that I took 15 years ago,” said Glenn Towery, owner of Fairy God Brother Productions and Film Company, LLC that produced the DVD, Long Live the Spirit, a documentary about the Million Man March. Immediately following the March, roughly 1.7 million Black men registered to vote and organizational memberships skyrocketed—the NAACP, churches and mosques reported huge increases and the National Association of Black Social Workers reported a flood of 13,000 applications to adopt Black children. The spirit of the March continues to this day. Over the years, the commemoration which also serves as the Nation of Islam's Holy Day of Atonement, has been held in different cities such as Chicago, Atlanta, and last year, Memphis, Tennessee. This year's event will be held in Tampa, Fla. The keynote address is scheduled to be delivered Oct. 17 by the Honorable Minister Louis Farrakhan at the Tampa Convention Center located in the heart of the downtown area. Thousands are expected from all across the United States and abroad to participate in workshops, seminars and vendors will have the opportunity to display their products and services. On October 16, 1995, the Honorable Minister Louis Farrakhan led over 2-millionmen in taking this pledge during the historic Million Man March in Washington, D.C. I PLEDGE, that from this day forward I will strive to love my brother as I love myself. I, from this day forward, will strive to improve myself spiritually, morally, mentally, socially, politically and economically for the benefit of myself, my family and my people. I PLEDGE, that I will strive to build businesses, build houses, build hospitals, build factories and enter into international trade for the good of myself, my family and my people. I PLEDGE, that from this day forward I will never raise my hand with a knife or a gun to beat, cut, or shoot any member of my family or any human being except in self-defense. I PLEDGE, from this day forward I will never abuse my wife by striking her, disrespecting her, for she is the mother of my children and the producer of my future. I PLEDGE, that from this day forward I will never engage in the abuse of children, little boys or little girls for sexual gratification. For I will let them grow in peace to be strong men and women for the future of our people. I WILL NEVER, again use the ‘B word' to describe any female. But particularly my own Black sister. I PLEDGE, from this day forward that I will not poison my body with drugs or that which is destructive to my health and my well-being. I PLEDGE, from this day forward I will support Black newspapers, Black radio, Black television. I will support Black artists who clean up their acts to show respect for themselves and respect for their people and respect for the ears of the human family. I will do all of this so help me God. The Million Man March was an unforgettable experience!! !